X-Large - $40.99 Only 2 left! She doesn't need your sympathy. This prisoner doesn't mind living her life behind bars. Living the life of a convict seems like torture to most, but that's not the case for this tough chick. She's done her crime and she's doing the time and she has no qualms about it. In fact, this baddie enjoys the prison lifestyle. She is friendly with all the guards and they all like her. Sometimes, they even hook her up with extra dessert, fresh from the kitchen. And prison food isn't all that bad! The meatloaf is actually very delicious. This inmate is also sly and strategic when it comes to hustling her fellow prisoners. If we were you, we wouldn't make a bet on a card game against her. She's spent a lot of time in the pen, so she knows every trick in the boot. If you get the nerve to call her out for cheating, try to refrain. She'll dole out a punishment way worse than any of the guards are capable of! Do you think you're tough enough to don the completely orange ensemble? Can you manipulate people with your words and intimidate people with your fists? Okay, even if you're not particularly cunning or violent, we have a feeling that you'll still like patrolling the yard in this costume because it's comfortable... extremely comfortable! The loose fitting t-shirt and elastic waistband pants are great for all kinds of activities, especially sleeping. 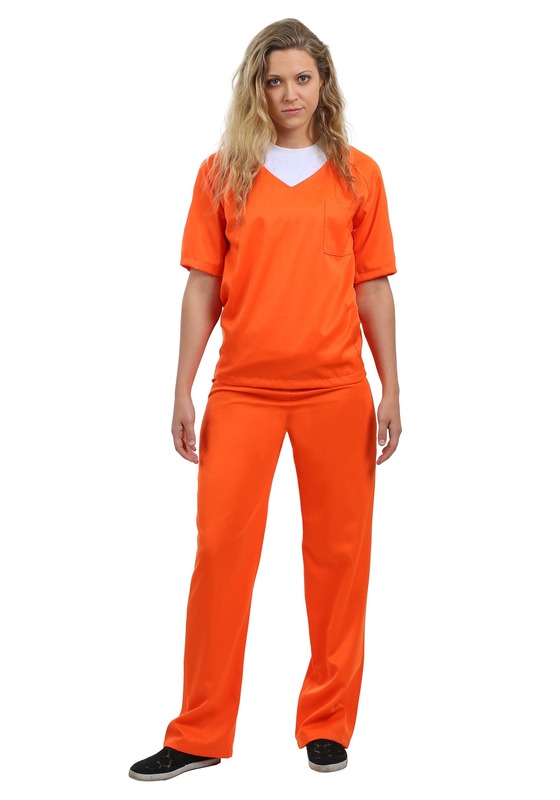 We have a feeling that you'll rule the penitentiary as soon as you're all shackled up in this costume!